What Makes a Music City? ‘Music City’ is a term that seems to be coming more and more common. Once it might have been used to loosely describe a place that has a good vibe for popular music activity – fun venues, a lively local pub, a place where visiting acts liked to play, but now it has come to mean something more specific, something more aspirational – a term that indicates value rather than type. A ‘Music City’ now indicates a place that engages with popular music as a key part of its identity. It’s a city that recognises its musical heritage as something important in its history. It distinguishes music events as key elements in its cultural activity. It also characterises the music industry as something positive and beneficial. At certain times in history some cities have had undeniable associations with music activity – Liverpool and Merseybeat, Berlin and Techno, Memphis and Blues. The US city Nashville has probably the greatest claim to being the original music city, home to the first international globalisation of a popular music style via the syndication of the Grand Ole Opry country music radio show across the US and Canada in the 1920s. It was here in the 1950s that the term ‘Music City’ was first attached to Nashville by announcer David Cobb on WSM-AM. I have just returned from another ‘Music City’ and one that also relishes country music (amongst lots of other styles…) – Melbourne, Australia. Just from the statistics it would seem that Melbourne’s right to the title is justified – with 470 venues and over 62,000 gigs a year there is plenty going on. Though it has its big stages, both in and outdoor, most of these venues are smaller – in music rooms of pubs and in clubs. Last week was Melbourne Music Week, which has a tradition of adding to the list of venues by creating a new, distinctive one, just for the festival. This time it was in the former Royal Women’s Hospital, built in the 1970s and closed now for seven years, where a cavernous concrete basement function room was tricked up with lights, a bar, temporary seating and air-con to deliver an atmospheric stage for a week’s worth of performances. Upstairs on the street alongside the entrance, trailers and mobile kitchens were parked to provide drinks, food, ticketing and a place to sit and chat or listen to a DJ. It wasn’t the only temporary venue built during the week. The Face the Music industry conference was simultaneously taking place in the Melbourne Arts Centre, but behind this smart location, on a scrap of unused land, The Trading Ground was erected from more trailers, shipping pallets, and shipping containers – one of which formed a seemingly continuously occupied stage treating delegates to original live music throughout the day. As well as Face the Music and Music Week, the city also delivered a town hall initiative – the Melbourne Music Symposium, a gathering of musicians, venue owners and managers, entertainment policy makers, academics and a few invitees like me who had experience or expertise from other places. The idea was to workshop the concept of ‘what makes a great music city’ and much of what was discussed focussed on the problems that the local scene faces, for example gentrification closing down older historic venues and pricing out musicians’ from local housing. There was, however, a general, almost tacit, understanding that popular music performance is ‘good’ for a city, and the activity it generates forms a good attractor for both tourists and people wanting to work and live there. However, there was also the real fear that it is seen as something that ‘just happens’, that punters perceive it as a benefit that has no cost – unless you are heading over to the arena to see a headlining act. The people in the town hall that day, all at the coalface of the industry, knew different. Popular music events require hard work by hard-working people. To happen they need skill and ingenuity to create the new places in the city that audiences flock to – places that have long lasting, though sometimes hard to trace effects. For example, the Royal Women’s Hospital re-use draws attention to a city resource waiting for something to happen. 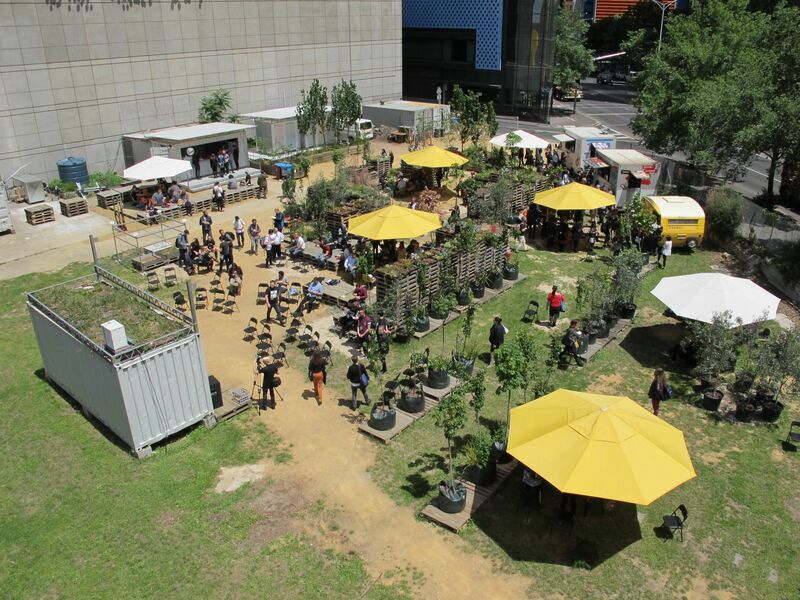 Melbourne Music Week 2014 used the Queen Victoria Market as its flagship venue and a year on a renewal master plan has been adopted and work is programmed to start in 2016. From a musician’s (and many audience member’s) point of view, the key thing is having somewhere to play that is affordable with a crowd receptive to what you have to offer. This is provided by venues like The Tote (and Max Watts, The Prince of Wales, and The Corner Hotel, all of which I visited in a busy few days). 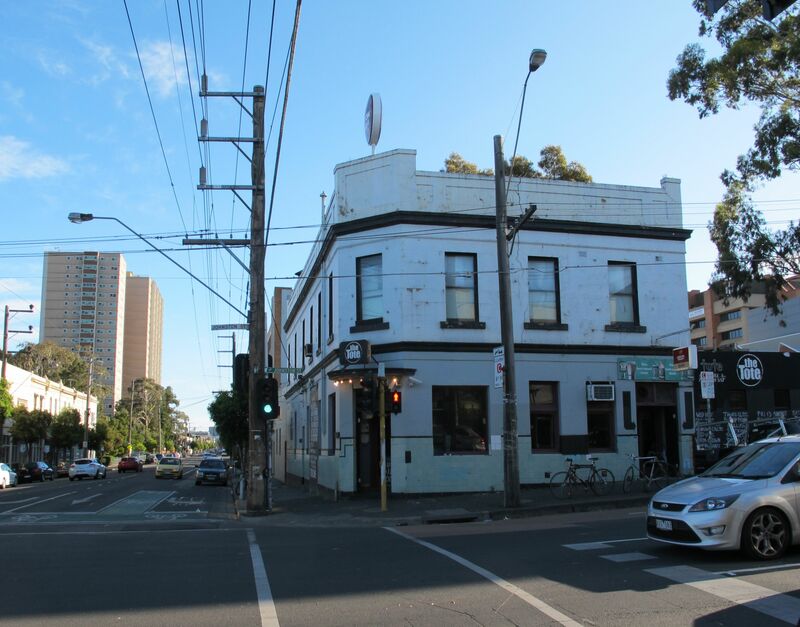 Run by Jon Perring it is a typical Victorian era corner pub in the Collingwood neighbourhood of Melbourne and yet it has three music spaces operating within its walls – the front bar, a main stage with adjoining garden, and an upstairs space. Its not smart but its very active, it has a predominant music style which the bands and artists are always breaking out of, there is something almost always on so you can just turn up and see what is happening. Its there because Jon and his partners/helpers have carefully managed its existence over twenty years fighting detrimental local government policy, financial disaster, and changing liquor and health and safety regulations. The Tote is a pivotal place in the history of popular music performance because when threatened with closure in 2010 due to controversial changes in licencing laws, it formed the centrepiece of a grass roots struggle to preserve live music in Melbourne. The Tote is the sort of operation from which musical activity grows, spills into downtown venues, festival stages, and eventually, the arenas. There is no doubt that its existence, and the others like it (including many of the other 466 in Melbourne alone that I haven’t mentioned), are what lie at the heart of what makes a Music City. Every ‘music city’ has them, the Cavern in Liverpool, CBGB’s in New York, 100 Club in London. Only a few become famous (and even these are not immune from closure), but without their continued operation it is certain that no city can continue to call itself a ‘Music City’ or perhaps more significantly, a ‘Musician’s City’.